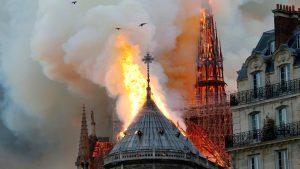 The Notre Dame Cathedral, one of the most iconic landmarks in the French capital, was engulfed in flames Monday evening as a catastrophic fire tore through the historic structure, collapsing its spire as fire officials raced to save the monument from total destruction. 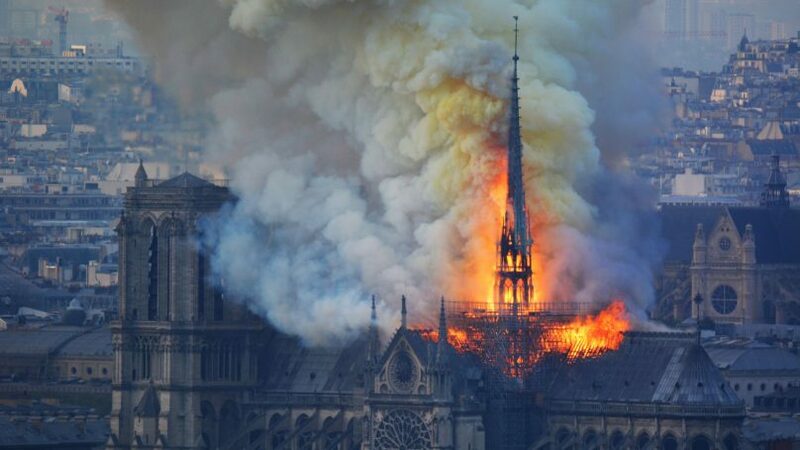 According to media sources, the fire that ravaged the 13th century cathedral was under control by Monday night. Jean-Claude Gallet, chief of the Parisian fire brigade, said one firefighter was injured while responding to the blaze, sources reported. Two-thirds of the cathedral’s roofing was destroyed, Gallet told the press. Retired FDNY deputy chief Jim Bullock told sources that churches, particularly cathedrals, are especially susceptible to fires. “It’s old wood that is dry and burns fast, and there’s a lot of wood in that building,” he said of the Cathedral. Notre Dame’s ceiling has been described as a “forest,” due to the amount of wood that was used in its construction. Some of it is hundreds of years old, and tinderbox dry. French President Emmanuel Macron also spoke out on social media to say that along with the entire country, he was “sad to see this part of us burn tonight.” Macron has vowed to rebuild the cathedral, and said he will seek international help to do so. About 12 million people visit Notre-Dame yearly, its is known as the most visited monument in Paris. The construction of the cathedral began in 1163 and was completed in 1345.